This is a journey into pain. Its the story of an eyepiece about which much has been written but few have tested or tried. The eyepiece in question has been attacked, denigrated, caused flames ,nay firestorms on Internet forums and generated something akin to religious warfare between some astronomers. I first caught sight of some early articles about Explore Scientific ES1400 sometime in 2009. So began for me a journey into pain. With an impending birthday coming up and absolutely no idea what to put on my wish list I decided in a moment of madness to ask for an Explore Scientific ES1400. There is a maxim which says 'be careful what you wish for - you might get it'. Whoever said that first showed remarkable perspicacity as I am sure they didnt think of credit card bills and astronomy eyepieces but I digress. Thanks to cretinous couriers and officious customs officials it was to be in fact some time before this potential iconoclast of eyepieces was to appear on my doorstep and longer than the gestation period of many large mammals before it was to find itself in a telescope under a dark sky. 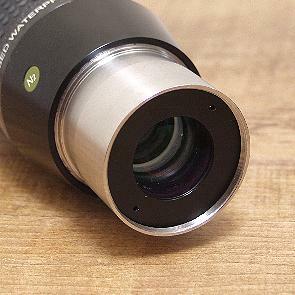 The Televue Ethos 13mm 100' FOV eyepiece first became available in January 2008 and launched in the UK with a price tag of £499. At that time the 13mm Ethos was the sole 100' FOV eyepiece available and received quite a lot of attention and many rave reviews. In August of that year I was privileged to be able to try one out and the views were in fact extremely good and I resolved to consider buying one at some undefined future point. The quality of the eyepiece was not in question but as an astronomer who is mostly mobile and often operating from uncertain locations I did have reservations about the Televue Ethos. Not in its ability to perform but in its cost. Knowing my propensity, given the mobile nature of my set-up, for accidental damage I was somewhat reluctant to part with the best part of £500 for a single eyepiece. If I were to wreck one of my Baader Hyperions it would be merely painful. An accident with a £500 lump of glass on the other hand would be more in the nature of a disaster. In short much as I admired the views I wasn't happy about the cost. I resolved to have a think about the Ethos but I knew in my heart I'd never likely be willing to part with the money. the view down the eyepiece barrel showing the dark green coatings and the high polish sheen of the ES1400 Eyepiece. The field stop ring and the finely finished tapered nosepiece. Theres nothing to fault in the Explore Scientifics quality control. The ES1400 is beautifully made. And now we move forward a year to my birthday. 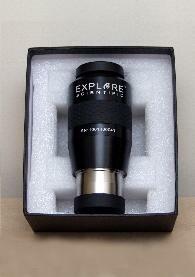 At this point the Explore Scientific was becoming available and to my rather pleasant surprise Explore Scientific started offering a whopping $100 reduction to introduce the eyepiece. This together with a favorable dollar rate bought the eyepiece down to the £300 mark - so a significant saving over an Ethos 13mm. Early reviews suggested the Explore Scientific could in fact compete with the Ethos in terms of its technical excellence. £300 was still more than I would like to spend but it seemed a good price and a good compromise and with that in mind I put the ES1400 on the wish list and let my partner spend the cash on the plastic card. In fact it was bought earlier than my birthday so that the eyepiece would be available for an early test at a forthcoming star party. Thanks in part to officious UK customs and a clueless courier the eyepiece did not in fact arrive in time for use at the Star Party and thanks to other commitments and the abysmal weather in the UK it was to be almost 10 months before I had the chance to use the Explore Scientific ES1400 for real. During the long wait to test the eyepiece out much has been written about the Explore Scientific ES1400, mostly from people who have not actually used it. It has been denigrated for amongst other things, the size of its cardboard packaging case (yes really), the stupidity of having a water proof astronomy eyepiece and not least for daring to challenge Televue in a market they had created. So forgetting the hype, the plaudits and the brickbats how does the Explore Scientific ES1400 14mm actually square up to the greatly lauded Televue Ethos 13mm ? I wish I could give readers of this a hard scientific answer but its actually quite impossible. What I can do is give you an honest opinion about the quality of the ES1400 build and some opinions of its views from both myself, an Ethos owner and some uncommitted observers based on relatively limited short testing under decent skies along with my own personal view of the eyepiece when used in conjunction with my two telescopes inlcuding one would not push any eyepiece to its limits. The Explore Scientific ES1400 was unavailable when I chose to buy one and had to be shipped in from a US dealer. After dealing with awkward UK customs, a courier who would get lost in a car park and a few other minor trials the eyepiece eventually arrived on my doorstep with a price, landed in the UK for £330 (The Equivalent Televue Ethos cost at the time was circa £485 to give you a direct comparison on price). The eyepiece case was, as expected huge and a picture below shows the size of the case compared with the cardboard box of a Baader Hyperion for comparison. As this eyepiece was being shipped quite some distance I was rather happy that it did have a huge box to protect it. Though I suspect that this box had space for an inordinate amount of cloud which was to blight every single night for testing. 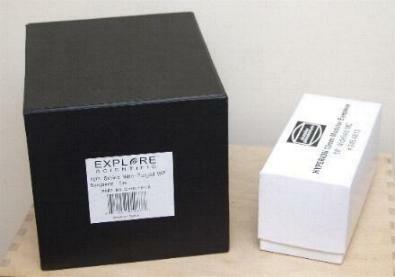 The gigantic box that the Explore Scientific comes in. The small box next to it is the carton for a Baader Hyperion. The eyepiece is well protected in its foam cut-out inside the oversized box. Opening the box revealed the Explore Scientific clad in a foam cut-out to protect it from its journey. My one carried the serial number of #41 which seemed to be about right considering how quickly it was ordered after release. Removing the eyepiece carefully from its box revealed an extremely well made piece of equipment. The anodising was flawless and the rubber grip was fitted perfectly There were no finger marks or blemishes on either its metal or optical parts and the machined barrel at the end showed a silky well polished finish. 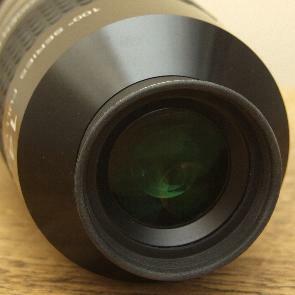 The eyepiece has no cut-out on its nosepiece but instead has a slight taper towards the end as a safety to stop the eyepiece slipping from a focuser too easily. This tends to work better especially with compression fit focusers as its reduces any snags when removing the eyepiece. The eyepiece has a rubber eyecup that folds up and down and the top cap bears a badge with the Explore Scientific logo both endcaps were a snug fit. The white logos and text on the eyepiece were precise and well applied and it looks like they will not easily be rubbed away over time. The whole impression is one of very high quality throughout. The coatings were a deep blue/green in color and perfect with no apparent thin spots or defects. The eyepiece weights in at almost 2lbs and could therefore present problems to some Dobsonian owners with balance of their scopes. It could also tip the limits for an EQ mounted scope which may already be close to its mount loading limit as well as tax some focusers. Unlike the Televue Ethos with its dual fit 1.25" and 2" fitting the ES1400 is 2" only. Personally I would not see this as much of a disadvantage as most owners of telescopes likely to buy an eyepiece in this class will have a 2" focuser. 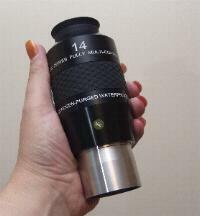 Whether the stock supplied focusers on most commercial telescopes can manage an eyepiece of this weight I cant comment. against a Baader Hyperion 13mm and a 25mm Plossl. Above - In the hand. The rubber anti-slip element provides a sure grip on the monster sized ES1400 eyepiece. It would be unfair to not give such an eyepiece a few tests under differing conditions and with a range of equipment. What follows is a series of test reports of the Explore Scientific ES1400 in different scopes, under different skies and on different targets. I will beg the readers indulgence for such a long report. First light with the ES1400 was with the eyepiece in my TAL 100RS, a well regarded 4" Achromatic Refractor. The first nights use created some frustrating moments. The moon was waxing but quite bright and largely wiped out any deep sky targets. As a result the ES1400 only really had a good run at the moon on its first night. It did though show staggering detail and razor sharp images. Now I know a 4" Achromat with an F10 focal ratio is going to make almost any eyepiece show its best and the only eyepiece I could compare it with on its first night was my trusty Baader Hyperion 13mm. Now I am quite partial to the Hyperion, its comfortable to use and generally shows some nice views but the ES1400 was so far ahead it was in a different league. In fact not even playing the same game ! The ES1400 generated a view that was like being in orbit over the moon. The entire moons surface was rendered in striking detail. With the entire moon almost filling the eyepiece I summoned over a seasoned lunar observer who pronounced himself somewhat amazed at the stunning level of lunar detail. A few other observers were given a look and were similarly impressed by the fine detail and the contrast of the views. A scan around other targets revealed not much more than promise because of the moon glow. Personally speaking I found the view somewhat hard on my eyes and the eyepiece took a bit of getting used to with its large field. The eyepiece showed no blackouts or kidney bean effects and my appraisal on a limited viewing was that the eyepiece was of serious quality and would probably yield up rather good views of deep sky objects once the moon was out of the way. The Explore Scientific in use with the TAL 100RS which shows again the size of this giant eyepiece. The ES1400 worked well on its first light with a slow scope of F10 but to be honest even a coke bottle would perform well in the TAL 100RS. So how did it perform in a more 'edgy' F5 telescope was it horrible with edge distortion ? Coma ? Poor color correction ? Pincushioning ? Well I'd love not to be controversial and not upset the Televue Fan Club (or risk being lynched at the next star party) and allow Ethos owners to sleep safe in their beds untroubled by the upstart Explore Scientific but.... I saw no noticeable aberrations in the view. I looked at the double cluster and found it to be good with no obvious defects. I observed Mars cross the Beehive and found it to be astounding. The ES1400 appeared to show not a single defect and I did look. There was no visible elongation or distortion of images at the edge that was observable by me. At times Mars, as it crossed close to the beehive was at the edge of the view and it stayed round, solid, free of distortion and with no apparent shift in color or shape. 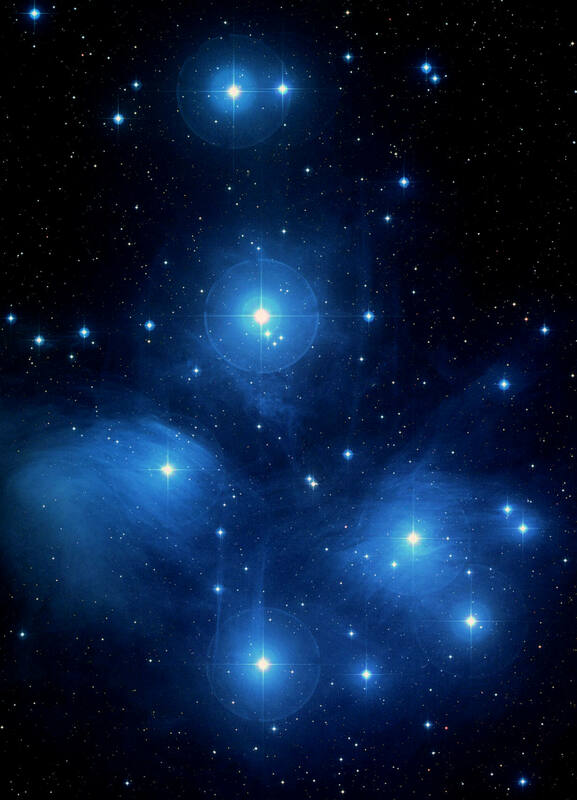 Stars were rendered as well as any eyepiece could. So should Televue owners wail, gnash their teeth, rend their clothing ? I don't think so. The ES1400 appears to offer a different experience. An Ethos owner who took a look preferred his Ethos. I didn't have a strong feeling one way or the other. I like the ES1400 - I also like the Ethos from the few times I have used one. The quality of views on the second light appeared not much different to the Ethos but the eyepieces 'feel' different. The ES1400 seems more comfy to me perhaps because of its slightly longer eye relief and the view is equally as good - at least to my eyes. As we packed up the British weather turned ugly and out of nowhere came a downpour proving at least that a waterproof eyepiece is probably not as silly as it probably sounds to someone living in Nevada. 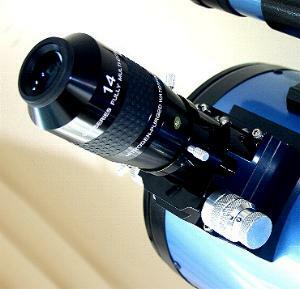 The Explore Scientific ES1400 installed in an 8"
an eyepiece of this size and weight. If the eyepiece showed a serious downside on the second night it was the sheer bulk of the thing and its weight which made the 8" Newtonian even more unwieldy than it normally is. A natural consequence unfortunately of the vast amount of glass inside this truly monster sized eyepiece. Needless to say with an eyepiece of this weight and size a serious focuser is an absolute must. Both of my main scopes have good quality Crayford style focusers but to my mind only something on the scale of a Moonlite is really strong enough to adequately handle this size of eyepiece. Showdown at the Salisbury Star Party - Head to Head with an Ethos. Finally over a year after the Eyepiece was ordered the ES1400 was promised a decent test under the dark skies of Sixpenny Handly in Wiltshire. Unfortunately on the only night of good seeing my main scope broke down with mechanical problems forcing me to rely on the charity of two other scope owners. Because of this testing was limited to only two targets. An Ethos 13mm and the ES1400 were used in two scopes and the views expressed below were from myself, the Ethos owner and an uncommitted third party. Test 1 - Scope Type: Celestron 9.25 SCT F10. M13 - The Ethos 13mm showed the core of the cluster perhaps marginally better but the ES1400 seemed to get the edge stars better defined with more contrast. The ES1400 seemed a little darker and less bright to my eyes but the Ethos owner felt he couldn't see much difference. Double Cluster - The Ethos owner felt he could detect the ES1400 verging on astigmatism at the edge of the field. I couldn't see it myself - I may have just not had good enough eyesight to spot it. I found it hard to get my eye 'in' to see the very edge of the field with both the Ethos and the ES1400. M13 - I found it hard to spot any substantial difference in the views. The ES1400 seemed perhaps very slightly less well defined at the very edge of the field to me but I found observing at the very edge of the eyepiece was quite uncomfortable with both eyepieces. The Ethos owner felt he couldn't see much difference between the views. Double Cluster - The view seemed identical in both eyepieces. Certainly too close to call- the ES1400 may have made stars at the edge of the field a little 'softer' but there wouldn't have been much in it. Neither I nor the Ethos owner could really find much fault in the ES1400s performance on this view. With the double cluster spanning the entire field of view it provided a good test of the ES1400s ability to keep the view under control to the very edge of the field. The uncommitted owner of the Dobsonian we tested in felt either eyepiece would be nice to own and found the views exteremely good through both eyepieces and felt he could see little difference between them. My conclusion is based partly on what I paid for the ES1400 (about £330 because the dollar rate was favourable and Explore Scientific were having a blitz and offering a hefty discount that made the eyepiece a bargain) - its as close to an Ethos as anyone can likely get and probably no worse for anyone with a scope of F5 and upwards. The Ethos might very well win out totally at focal ratios faster than F5 - I was not able to test that out having no telescopes that fast available to test with. BUT (and its a really big BUT ) at the prices the UK astronomy retailers are charging in the UK for an ES1400 I'd be more likely to buy an Ethos. The pricing difference is so small and for the small amount of extra cash I'd probably not have been willing to take a chance on the Explore Scientifics performance and I'd also take into account the Ethos might well have a better second hand value long term. Resale value is hard to gauge because so few ES1400s have come up for sale on the second user market and the few that have appeared have obviously been acquired in the USA. At £300 the ES1400 was a bargain and if Explore Scientific and their UK dealers got aggressive on pricing I am sure they would find a ready market for what, when all is said and done, is a very fine eyepiece in its own right. So would I recommend the Explore Scientific ES1400 to other astronomers ? The answer in strict price/performance has to be yes for anyone who can acquire one at a price significantly lower than an Ethos. Most of us wont spot any significant performance difference. Forget for a moment the Ethos comparisons and you will see that the Explore Scientific is a very fine piece of engineering within its own right. Beyond the strict performance/price criteria I have doubts though. Not just about the ES1400 but the whole 100' FOV position. I am going to be radical and suggest that, for some of us at least, the whole 100' FOV is a kind of marketing puff that creates a need but doesn't address any real issues. A technical masterpiece but ultimately a snare for snarks. The human eyeball has a natural FOV around the 70' mark and some would say its even narrower than that for our main vision. It sounds appealing to have a vast FOV in the eyepiece but I actually find it, after the initail euphoria, not actually very useful. Maybe its me but I have spoken to others who feel the same. I didn't find either the Ethos OR the ES1400 particularly comfortable to use - not because of its optics or eye positioning, the ES1400 is remarkably tolerant in fact with good eye relief and no vices, but because a good portion of the view is not observable without swivelling your eye about. Its analogous to sitting in the front row of a large cinema. You get closer to the centre of the screen but what's happening at the edge becomes distracting. The fact that you have to swivel your eye about inside the eyecup to see the edge seems to me pointless at best and distracting at worst. I would go so far as to say I find it actually mildly irritating. Its an interesting experience but no more than that. With calm consideration and time to reflect I seriously doubt the value of any eyepiece with a 100' FOV both on functional grounds and on cost. Think about this - for the cost of a single 100' FOV eyepiece you could buy almost a complete set of something offering a 70' - 80' FOV and which would perform very well indeed, probably within an ace of the ES1400. To use the cinema analogy an 80' FOV provides a big screen experience but at a comfortable distance where you can see all that is going on without swiveling your eyes or your head. 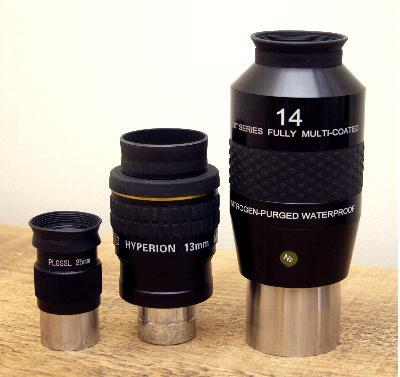 Whether you find 100' eyepieces appealing or not is a matter of taste and in matter of taste there really can be no dispute. Personally speaking for the reasons I have outlined above, despite the fine quality of the views with the Explore Scientific ES1400 I would not acquire any further 100' FOV eyepieces. For me the cost just doesnt make sense. 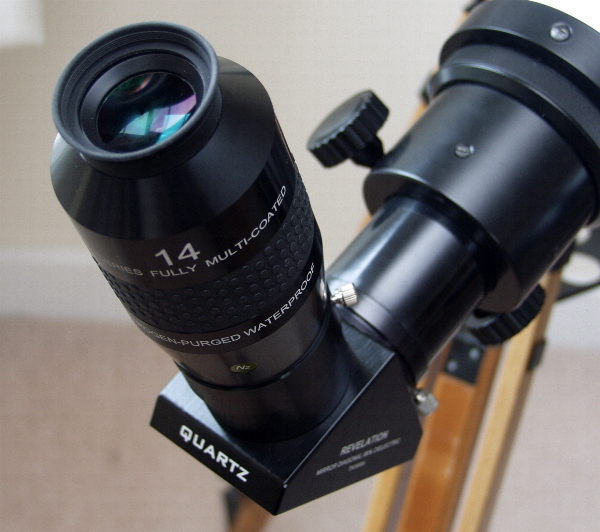 I will keep the ES1400 as a unique eyepiece but I wouldn't seek to add to it with additional eyepieces of a similar type and that includes the Televue Ethos.